“It’s been a long time,” artist Tom Bartek responded, when writer Roger Welsch, in an NETV interview asked how long Bartek had been making art. Born in 1932, Tom Bartek’s 2012 Retrospective celebrates 60 years of art making in three different venues; Creighton’s Lied Gallery (paintings), Sept. 14 – Oct. 19, Nebraska Arts Council’s Fred Simon Gallery (serigraphs), Sept. 24 – Nov. 2, and University of Nebraska Omaha’s Art Gallery (assemblages), Oct. 5 – Nov. 8. The woman pictured in “Woman with Wine Glass”, 1956, absentmindedly holds a wine glass while gazing at an unlit candle. A tightly constructed formal composition holds the viewer’s gaze. The viewer’s perception of her gaze underscores “vision” as the painting’s theme. This heightened awareness of observation is a subtext which carries itself throughout the exhibition. The flat, shape stylization in the very early work gives way, by 1973, to a fuller resolution of three dimensional form. “Dry August”, 1973 pictures a figure in the doorway of a building as seen from the interior space of another dwelling close by. The painting’s point of view is directed outside. The viewer is presented with a beautifully painted interior, yet invited to look beyond it. Three adjacent windows in “Winter Interior with Sunlight”,1978 work to frame one child, one tire swing, and two children successively. The children are walking outside on a cold winter afternoon their destination unknown. What is known is Nebraska’s breathtaking cold and light, so palpably captured on a winter’s day. The woman in “Nebraska Interior – December, 1978” appears deep in thought while the children outside are active. The still-life in this interior scene becomes the fulcrum of balance for what might be any family dynamic. Considering Bartek’s reflections on points of view, it is no surprise for the emergence of a new hybrid realist series containing multiple points of view. The nine hybrid realist paintings in the exhibit are lively and interesting to see. The most poetic of the group “Bridge of Broken Dreams”, 1984 is a compelling self-portrait. Superimposed on Bartek’s forehead is the image of his beloved dog Louie turning to look at the viewer. The parka Bartek is wearing emphasizes the connection between man and dog. A sunset through trees, daylight on the river, or the scaffolding of a bridge all contribute to a powerful visual statement. “Bridge of Ecstasy – 1983”, contains variations in compositional balance. The formal juxtaposition between a group of pigs, a bridge, and blooming hollyhocks becomes a lyrical visual puzzle. The title adds mystery toward a solution for each viewer to interpret. “Charles Darwin with Dead Bird”, 2007 is a portrait done from a picture Bartek found in the newspaper. In his Self-Portrait, the artist positions his figure on the right side of the composition, looking out toward the viewer. Darwin’s figure, in contrast, is positioned on the left side of the composition, looking down toward the right. The ambiguous space surrounding Darwin frames his black hat, white beard, and hand holding a dead bird. The poignancy of this image resonates with one of the serigraph prints on view at the Nebraska Arts Council’s Fred Simon Gallery. “Man with a Dead Bird”, 1973 is positioned in the middle of the composition. The ambiguity of the space surrounding him is not as somber as Darwin’s, as he holds the dead bird up. Many of the serigraphs connect back to the paintings. Bartek’s technical command of screen printing’s layering process masterfully reinterprets original painting compositions. The hybrid realist “Dark Window” combines color and composition into one satisfying image, as does the one-point perspective of railroad tracks in “Fall Crossing”. There are also two unique silkscreens in the Fred Simon Exhibit, each done with torn and cut paper stencils. On view in UNO’s Art Gallery, at the Weber Fine Arts Building, the assemblages combine the layering processes of painting and serigraphy with photography, carpentry, and the unique sensibility of an artist driven to find a universal truth. “Pine Ridge Evening Spirit”, 1994, can be seen immediately upon entering the gallery. The assemblage incorporates found objects with a built structure, displaying multiple exposed black and white photographs of an abandoned ranch near the Pine Ridge Trail in Northwest Nebraska. The geometric layout of assembled parts unifies the piece, while the variation of tree branches with found objects anthropomorphizes it. The piece conjures a spirit of place, setting the tone for the installation as a whole. The early assemblages, such as “Bison”, “Composition with Coyote Skull”, and “Composition with Steer Skull”, all from 1966, communicate Bartek’s reflections beyond family life. This bold, striking series is a departure from the domestic interiors. The power of Nature establishes itself here as another important theme in the life of this artist. “Winterwalk-Wabash Trace – Path of Spiritual Progress”, 1991, uses a subtle asymmetry to build a sense of containment. The variety and proportion of physical elements balance the photographic illusion of a path ahead. The dog on the path pauses, and turns, as though to beckon one forward. The dog in art history is a symbol of faithfulness or fidelity, perhaps serving that purpose here. 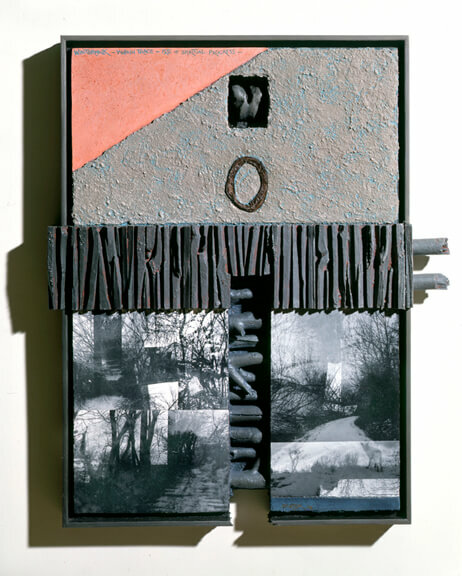 The free standing and wall assemblages incorporate branches, rectangular structures, paint, and photography. Two circular elements in some of the constructions seem to reference eyes, while the rectangular structures reference walls or flat figures. The paint color provides tone, the photography an illusion of complexity. The proportions of these assembled components, in each of the pieces, become a unique riff on the human condition. “Pine Ridge Manitou – Trunk Butte Creek”, 1998, is considered and thoughtful seeming to dance with its thoughts. By contrast, the smaller “Flint Hills Manitou”, 2000, expands and contracts a different view from each side. The smaller wall assemblage “Oglala Grassland-Near Hat Creek”, 1999, is a beautiful meditation on earth and sky, as well as our place between them. The geometry of the inverted roof pitch in the photo balances the small objects tucked away to its left. Bartek’s assemblages are poetic architecture of largeness and smallness, interior and exterior, creating spaces for a collective consciousness. Seeing them in the gallery space it is hard not to imagine them outside. If they were placed in a natural environment the reverse might be true. The 2009 “Marie Curie/Albert Einstein in Switzerland” wall assemblage is unique in its choice of subject. In contrast with the painting of Darwin holding a dead bird, Curie and Einstein are pictured in conversation on a hillside, beside a path. The construction contains them in a spirit of place. This piece seems to be a reminder there is always more to learn, to discover and discuss. The Universe yields its truth in many forms. The same may be said of the Tom Bartek Retrospective, one exhibition in three venues, the accomplishment of a gifted artist to be savored and celebrated. Tom Bartek Retrospective; Sept.14 – Oct.19 Creighton’s Lied Gallery (paintings) 1- 4 pm daily, www.creighton.edu/liedgallery, Sept. 24 – Nov. 2 Nebraska Arts Council’s Fred Simon Gallery (serigraphs) 8 am – 5 pm daily,1004 Farnam Street, www.nebraskaartscouncil.org/, Oct. 5 – Nov. 8 University of Nebraska Omaha’s Art Gallery (assemblages) 10 am -3 pm Mon – Thurs, www.unoartgallery.org Bartek will be giving a Gallery Talk at 7pm, Thursday, October 18 in the UNO Art Gallery.